In an attempt to resolve the Obama/Clinton primary controversies once and for all the Democratic National Committee (DNC) called upon the Liberal Genetic Engineering Community (LGEC) to solve their problem. 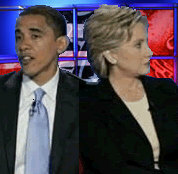 Hillary Rodham Clinton and Barack Hussein Obama were genetically recombined into a single entity. This new being, named "O’Hillary," will almost certainly be the overwhelming favorite amongst both Obama and Clinton supporters. 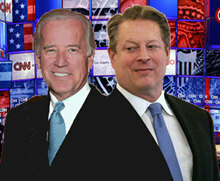 "We were looking for a solution that would satisfy both campaigns," stated Howard Dean, Chairman of the DNC. “Despite the apparent capitulation of Hillary Clinton and her campaign we still sensed that a significant portion of the Clinton camp was intent on supporting the Republican candidate out of spite and a feeling of rejection, especially with the selection of Joe Biden as the Vice Presidential candidate. That was just not acceptable. With this solution we feel that we can accomodate everyone involved. In fact, we anticipate the immediate defection of a significant portion of Sen. McCain’s hard-core drunken-Irish support due to affinity for O’Hillary’s name alone. Add to that the uneducated working white, black, female, transgender, evil scientist, and the conjoined twin demographics and we are all but assured a win in the general election." O’Hillary was first introduced to the public during a recent press conference to the blare of U2’s When Two Hearts Beat as One. This was not aired due to the violent content and adult language. While the newly unified candidate still spars amongst his/herself, it is hoped that the impossibility of separation will eventually force its individual aspects to concede to acting as a single, symbiotic entity. Until then, the Secret Service is doing what it can to keep the two safe, and doctors are reasonably sure they can surgically reconstruct Obama’s left ear. Unwilling to sacrifice malcontent supporters of either Obama or Clinton, the DNC appealed to genetic research lobbyists forever courting Democratic Party legislators. "We were just happy to be of service," commented Dr. Dicensplicem. 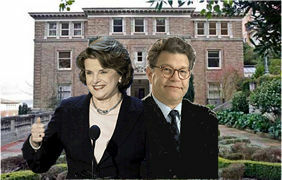 "And the home of Sen. [Diane] Feinstein was the natural location to perform the procedure. Her home is fully equipped with the latest in genetic engineering equipment for use in her life-prolongation project." On a related note, the DNC wants to dispel any rumors of combining senatorial hopeful Al Franken and Sen. Diane Feinstein, primarily since no appropriate conjoined name could be agreed upon. However, the Discord was able to obtain this photo. Having finally found the ultimate lobbying tool in the production of high-appeal, cross-demographic candidates through the recombination of DNA, it is thought that the genetic research community will receive unprecedented support and funding from the federal government once O’Hillary takes the White House. This trial, now found to be successful, will almost certainly lead to the production of the ultimate running mate for O’Hillary, Bore. We are Bore … resistance is fubar.